A presentation and reading from a new publication, Persist: In Praise of the Creative Spirit in a World Gone Mad With Commerce. This session addresses the predicament of creative people of all kinds—artists, writers, actors, musicians, dancers…–in a cultural environment in which success is most often measured in commercial terms, and where it is increasingly difficult for even the most talented to get a hearing. In this context, we’ll be thinking specifically about the benefits for the artist of a disciplined mind and a commitment to practice—how to acquire and develop these qualities, and how to apply them to creating a life in art that will survive the vicissitudes of an art world dominated by market concerns. A former art school Dean (Otis Art Institute, Loyola Marymount University) and a widely-published art writer, Peter Clothier brings the perspective of long experience and an empathy for the creative passion. 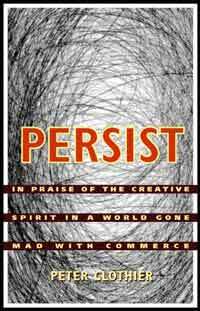 His new book, Persist: In Praise of the Creative Spirit in a World Gone Mad With Commerce, will be available for $15, cash only. Reception is on March 6, 7-9pm or later.